Jaleo Opening at Disney Springs West Side! We are so excited about this!! There has been much anticipation around the opening of Jaleo by Chef José Andrés, which celebrates traditional Spanish cuisine in a festive atmosphere. Today, we're happy to announce the wait is over – Jaleo at Disney Springs® West Side is slated to open for dinner on March 17, 2019. 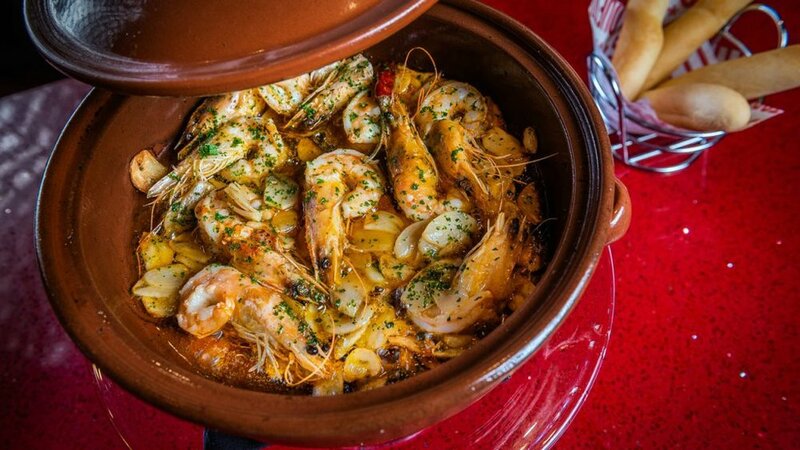 Jaleo at Disney Springs will feature an extensive menu of tapas, the traditional small plates of Spain, as well as savory paellas, sangrias, and a selection of Spanish wines and sherries. The celebration of these flavors in an inviting, vibrant atmosphere is a hallmark of all Jaleo restaurants. Jaleo offers an excellent selection of embutidos (cured ibérico ham, pork chorizo, and spreadable cured sausage) and quesos (cheese from cow, goat, and sheep’s milk). The Queso Massimo, an Asturian raw cow’s milk cheese made exclusively for Chef José Andrés and Jaleo, is cured for four months with the pulp from Asturian apples. A variety of authentic paellas cooked over a wood-fired paella pit are a highlight and are available by the plate or pan. Select specialty paellas are available each night with entire pans prepared to order for eight or more guests and presented tableside. Ensaladas y Mas options include Gazpacho estilo Algeciras, the classic chilled Spanish soup made with tomatoes, cucumbers, and peppers; Ensalada de coles de bruselas con albaricoques, manzanas y jamón serrano, a delicious dish of warm Brussels sprouts salad with apricots, apple, and serrano ham; and Ensalada de remolacha con citricos which is a salad of red beets, citrus, Valdeón cheese, and pistachios with sherry dressing. Perfect for sharing will be traditional chicken fritters (Croquetas de pollo) and Aceitunas modernas y clásicas – ‘Ferran Adrià’ liquid olives and gordal olives stuffed with piquillo pepper and anchovy. A traditional Spanish omelette with potatoes and onions (Tortilla de patatas clásica) is also offered for the table. On the restaurant’s front corner adjacent to the Jaleo entrance will be Pepe by José Andrés, the first brick and mortar location of the chef’s popular Spanish food truck. Pepe will be open for lunch and dinner beginning March 17. Jaleo at Disney Springs will be open for dinner starting March 17 with lunch service beginning later in the month. This is a great opportunity to visit the 3 deluxe monorail resorts! Start off your tour at Disney’s Contemporary Resort sampling an appetizer & specialty beverage. Next, board the monorail for Disney’s Polynesian Resort. Here you will be able to indulge in tropical inspired appetizers & drinks! Disney’s Grand Floridian Resort is your next stop! Sip champagne & sample delicious cheeses & charcuterie before your main course at Citricos. Lastly, you will return to a private patio at the Contemporary Resort for desserts, coffees & cordials while viewing the Magic Kingdom’s Happily Ever After fireworks show! Contact your Upon a Star agent to add this experience to your Walt Disney World vacation package! Highway in the Sky Dine Around-More dates available now! More dates for Highway in the Sky Dine Around have been announced! This exciting culinary journey on the Walt Disney World Monorail takes you to three Disney resort hotels, where each destination offers a new delicious experience. Your journey starts with appetizers and cocktails at The Wave…of American Flavors at Disney’s Contemporary Resort. Next, you will travel to Disney’s Polynesian Village Resort to delight in dishes inspired by the South Pacific. And then, it’s off to Disney’s Grand Floridian Resort & Spa where you are invited to sit back, sip champagne and enjoy an artisanal selection of cheeses or charcuterie before enjoying the main course of their trip at Cítricos. The final stop on your culinary journey takes you back to Disney’s Contemporary Resort where you’ll retire to a private patio to enjoy a delectable array of desserts, cordials and coffee. Here, your Clients will be able watch in wonder as fireworks light up the night sky over Cinderella Castle for the grand finale of your adventure. Reservations are available until the end of December! These spots will fill up fast! Contact your Upon A Star expert today to reserve your spot today! Want to plan a Magical Vacation? Contact our highly experienced agents today! Quick Service Dining in Disney: Epcot Edition! A few weeks ago, I began a series on Quick Service dining around Walt Disney World. If you missed part 1, you can catch up here. Today, we will be heading around Epcot and talking about my favorite Quick Service eateries and snack locations! Epcot has such a huge amount of options for food. It also has my favorite Quick Service restaurant on all of Walt Disney World - Sunshine Seasons! This place is my favorite for a variety of reasons. First, it is located in the Land Pavilion, which is my favorite. It's my happy place, and sometimes during a stressful day I like to envision sitting in the food court area here, looking up at the Seasonal Hot Air Balloons that decorate the ceiling. Of course, the important part, even more than the atmosphere, is the yummy food! Sunshine Seasons has a variety of options: Stir Fry, Salads, Sandwiches, Rotisserie Chicken, Soups... and so much more! The pastry section never ceases to amaze, and you are sure to find something for every palate! There are also fantastic breakfast selections. In all my food pictures, I am ashamed to say that I do not have a single picture of my typical order here -- the salmon over green beans. It's so amazing! I do have a picture of my husband eating his favorite dessert, though -- a red velvet whoopie pie! Sometimes, though, when we are ready for lunch, we are back in World Showcase. On those days, we love to try out the countries. We have recently come to really enjoy the food at the Liberty Inn (American Adventure Pavilion). All American food with options like Hamburgers, Chicken Wraps, S'mores & Apple Pie abound here. I've always found the food to be tasty, and the lines aren't too bad, either! I also want to give a shout out to 2 of my favorite snack options here. First up is Karamel Küche in the Germany Pavilion. This is Werther's Caramel at its finest, and holy moly is this place good! My second shout-out goes to France. Between La Boulangerie Patisserie (pastries & coffee) and Les Glaces des France (ice cream), I don't know if I can pick! So, there you have it. Next time you're at Epcot, give one of these options a whirl - and let me know what you think!